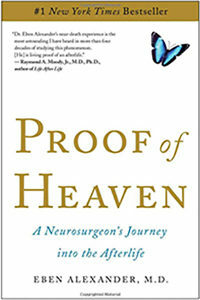 "Proof of Heaven: A Neurosurgeon’s Journey into the Afterlife" by Eben Alexander, M.D. It’s only proof to Dr. Alexander, of course, but he makes a darned good case. Eben Alexander is a neurosurgeon. He believes in the afterlife about as much as most neurosurgeons do. Which is to say, not at all. So, he is well aware how his story will sound to colleagues. But he decides it needs to be written. It begins when Dr. Alexander has a seizure that lands him in a coma for seven days. He has contracted a brain infection that is so severe, the doctors can’t figure out why he’s even still alive. No one can come up with any possible reason for him even having this infection in the first place, or for it apparently being antibiotic-resistant. And after seven days, nobody is sure they even want him to live because of all the damage that has to have been done to his brain. And they most certainly can’t explain how he could wake from the coma at all, much less recover fully. There is no way I could list even a small portion of the story Dr. Alexander relates in Proof of Heaven. I will tell you one thing. He brings back an explanation for evil in the world. Evil has to exist. Without it, there is no free will. Think about it. How can you choose good if there is no choice, if good is all there is? And without free will, there is no spiritual growth. If you subscribe to the concept of God and us being separated from that power, then without free will, there is no way back to him/her/it/Om. But he says there’s just a grain of sand’s worth of evil. The rest of it, presumably, we create on our own. Dr. Alexander did not see a tunnel or a bright light drawing him to it. This may be because he did not, in fact, die. He never flat-lined. From what he is told, the plan was always for him to return here. But he had a lot to learn in a very short amount of time, which, presumably, accounts for his illness. I mean, nothing else does. The book is an easy read. Take a look at it. Especially if you think it’s all b&*$. Hey, what’ve ya got to lose?